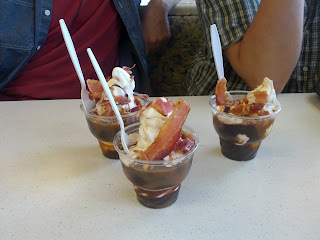 Thus completing a trifecta of fast-food taste tests, a couple buddies and I had lunch at our local Burger King, and finished off with a desert of BK Bacon Sundaes. This is BK's recent food innovation, pairing a fudge sundae with "crisp" bacon. It follows a wave of irrational yet delicious love for bacon which has swept across America in the past several years. Could this represent the dish with which bacon loses its fad appeal? In my opinion, the bacon sundae isn't great. I don't particularly love fudge sundaes, and I didn't think the bacon added anything at all to the experience. It wasn't particularly crispy or hot bacon so it just sort of represented something you had to chew and swallow after the accompanying bit of ice cream was long since swallowed. I didn't even finish half of it, to be honest, and I agree with pretty much everything this guy says. There may be a new item on the menu though: ice cream nachos.